Sea Street Beach, just steps away! 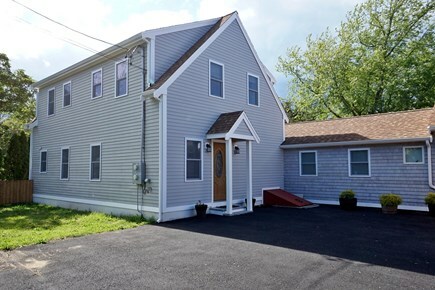 This two story, 5 bedroom, 3.5 bath, completely renovated, new-to-the-market villa is just a few homes away from beautiful Keyes Beach and close to Main Street Hyannis and Hyannis Port. The Keyes Beach is located on the Nantucket Sound side of the Cape with the warmest waters on Cape Cod. 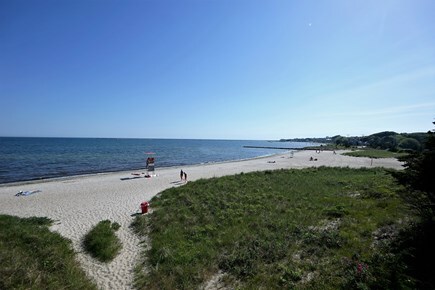 A wide stretch of sand, many activities, a shady picnic area with tables and grills, a snack bar, lifeguards and other facilities, and lovely views out to Atlantic make it an ideal spot for your Cape Cod vacation! 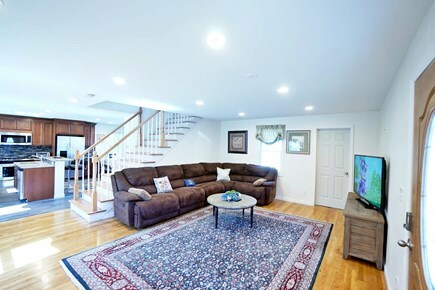 On the first floor, open and airy space seamlessly flows from the sunlit living area to the dining area for 10 guests and to the modern, brand new, and fully equipped kitchen. 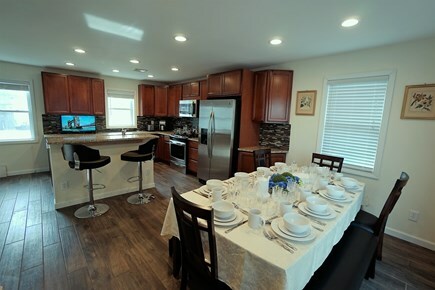 The house is excellent for several families vacationing together. 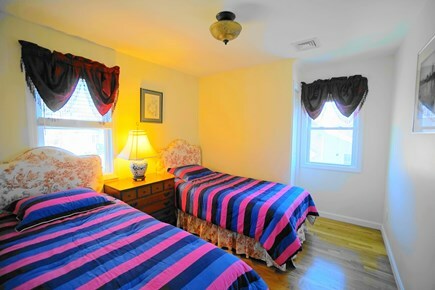 There is one spacious master bedroom suite (king size bed) with a full bathroom on the first floor. 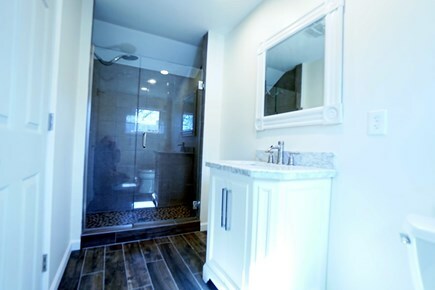 The second floor features four bedrooms and two full bathrooms. 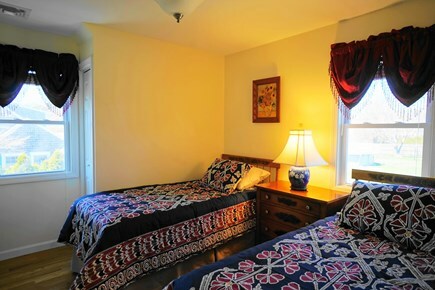 Two bedrooms include two queen size beds in each, and the other two bedrooms have 4 twins. You will sleep like a rock on the new mattresses from Macy’s after busy days! 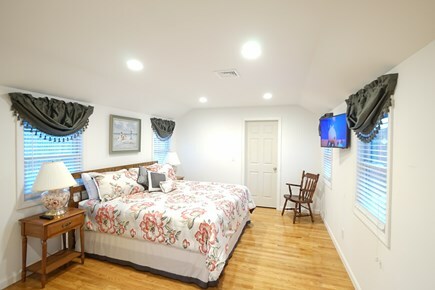 For your comfort and convenience, the house is equipped with Central Air Conditioning, Washer and Drier, 4 New LSD HDTVs, Free Wi-Fi Internet. We provide high quality (from Macy’s and Bed & Bath) bedding, linens, blankets, beach and bath towels, kitchen electriconics, cookware, cutlery, coffee makers, pots, pans, dinnerware, flatware etc. Also, we keep for you beach chairs/umbrellas, paper products, soap, shampoo, shower gel, a hair dryer, laundry and dishwasher supplies, tea and coffee. 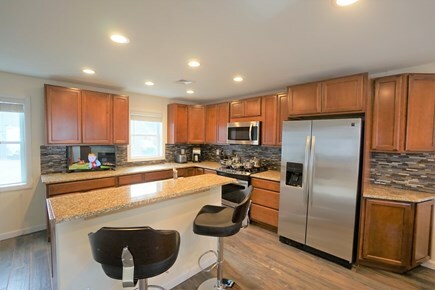 Our home is surrounded by a large, fenced-in yard with a south facing, partially shaded deck which is set up with a comfortable outdoor furniture, and there is a grill for those barbecues! When you are not on the beach, take advantage of the many fun activities this part of the Cape is known for. Enjoy a pleasant walk to all the excitements, shops and restaurants Hyannis has to offer, sample ice cream (or frozen custard! ), learn more about American history in the JFK Museum and Library, pop in to an amusement center for a game, or enjoy dining and music in one of many renown restaurants on Main Street! Do not forget about Hyannis Harbor with its deep-sea fishing charter boat, ferries to Nantucket and Martha's Vineyard, harbor cruises, parasailing, whale-watching cruises, and much more! Booklets with all local activities and maps will simplify your choice! We accept mature well-behaved dogs at an additional charge with prior approval. The parking lot on the property is for 4- 5 cars. Additional pricing info: Cleaning fee- $250.00, REFUNDABLE Damage Deposit - $500.00, Pet fee - $150/pet/week or $30.00pet/day, State and local taxes of 14.45% will apply. I stayed here for 2 nights with seven other men for a golfing weekend. Everything was fabulous! No complaints. Plenty of space to hang out and socialize, grill out, cook and sleep. The hosts were super quick to answer any questions via email or text and were very accommodating. We all would look forward to staying here again in the future! Thanks Alex! The house is large and very beautiful! It was perfect for the 10 of us and so close to the beach!! Villa #2 is a great set up for a large family. 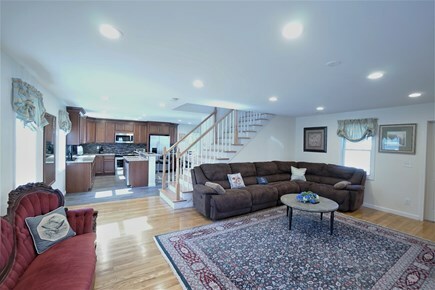 The combination of a master suite downstairs and four bedrooms upstairs is an efficient layout. The Villa comes equipped with towels, linens and a few essentials to get started. 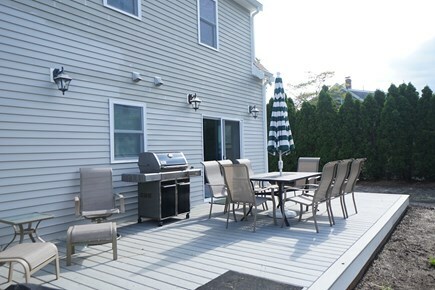 The back deck is great for al fresco dining. The Villa is a short 3-4 minute walk to a clean, low populated calm beach. If you want wave action, the close-in beach won’t make you happy. The Villa comes complete with a beach umbrella and chairs so there is little need to load up the car with these supplies. Great place to stay with family or friends! I would recommend this house to anyone. 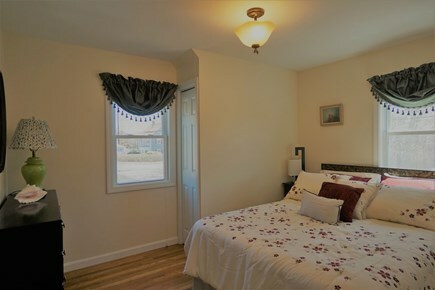 It is very clean and had great amenities. 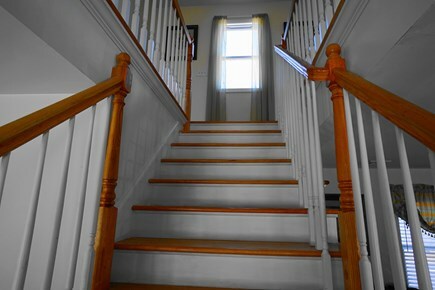 The house is situated on a dead end street so it is pretty quiet with convenient routes to everywhere we go. The beach is very close by too! 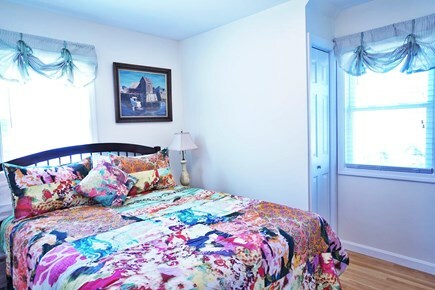 When we walked in the house, it still has the new house smell :) All the rooms are cleaned and furnished with great linens. Alex is extra helpful and quick to respond when I texted him. Great stay overall! The house was very nice and convenient to all in Hyannis. Inside is new and Alex the owner was very responsive to any of our needs. Where it was a new rental unit it was missing a couple of kitchen items , but when we notified the owner he went out immediately to get the items and bring them to us. It is pretty centrally located to center of town and the beaches. It was a great stay and rental.